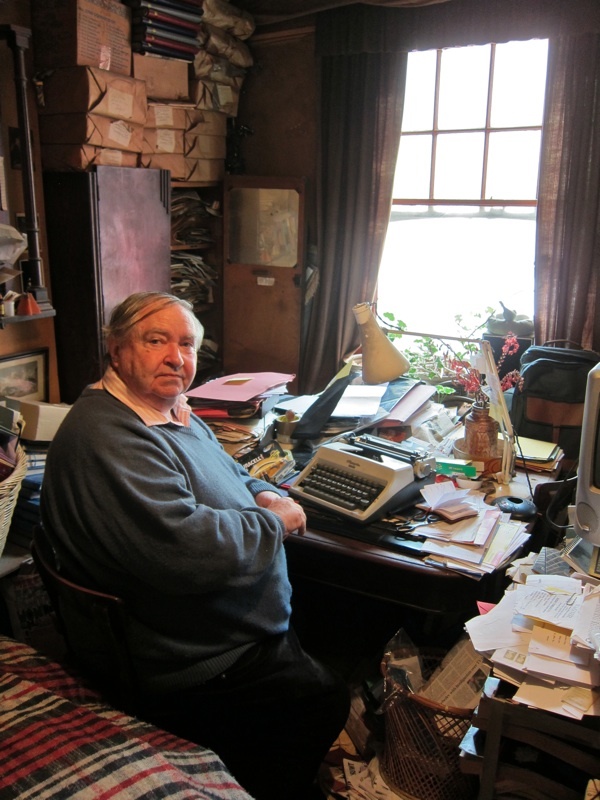 Writer Clive Murphy has lived in his two room flat above the Aladin Curry House on Brick Lane since 1974 and filled it with an ever-growing collection of books, papers and memorabilia. 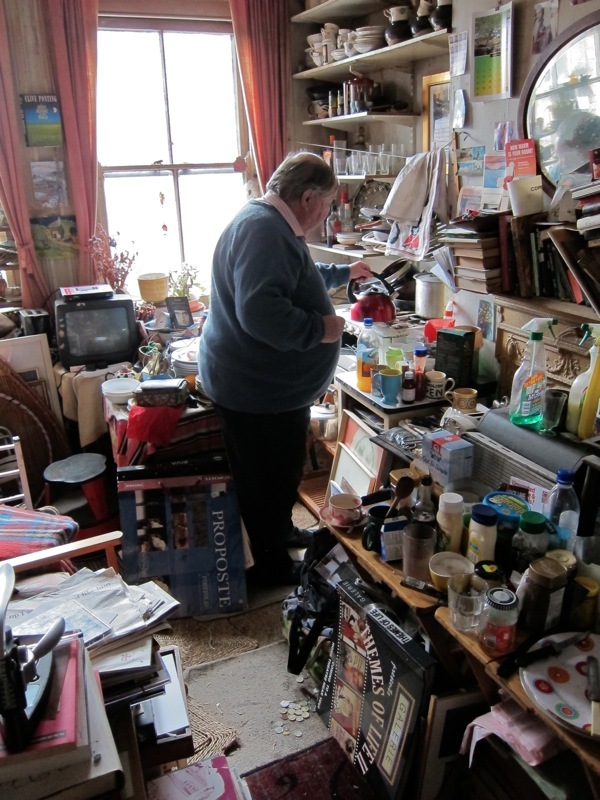 But this weekend he is going to tidy up, and so I realised I must record Clive’s glorious disarray lest his environment lose any of its charisma in the process of getting organised. When Clive saw the card in the window and rented this flat, it was above a draper’s, but that went long ago as the Bengali shops and curry houses filled the street. Then, in more recent years, the nightlife arrived, with clubbers and party animals coming to throng Brick Lane at all hours. 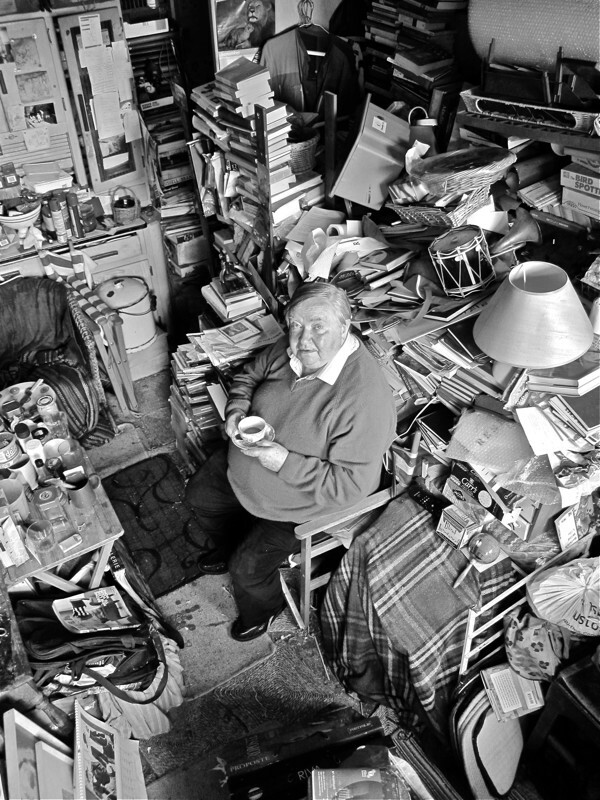 Yet, throughout this time, Clive has lived quietly on the first floor, looking down upon the seething hordes of visitors and inhabiting a private world that is largely unchanged, save the accumulation of books and leaks in the ceiling. Walking up the narrow staircase from the street, you come first to Clive’s kitchen looking back towards Hanbury St and Roa’s crane. 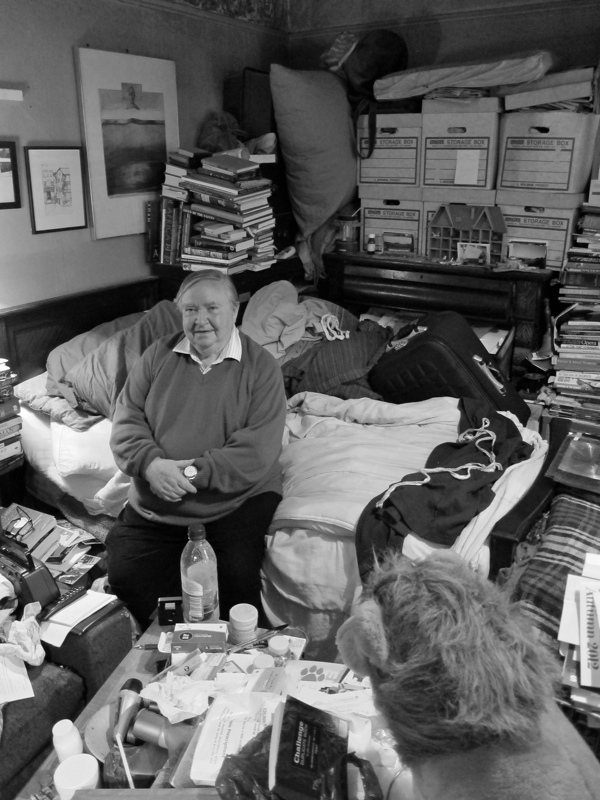 At the front is a larger room looking onto Brick Lane which serves as Clive’s bedroom and study, lined with fine furniture barely visible under the tide of paper, and sitting beneath a water-stained ceiling that resembles a map of the world. “I’ve had so may leaks and serious floods,” Clive recalled philosophically, “I have been sitting in the kitchen and water has come from the ceiling like from a tap. 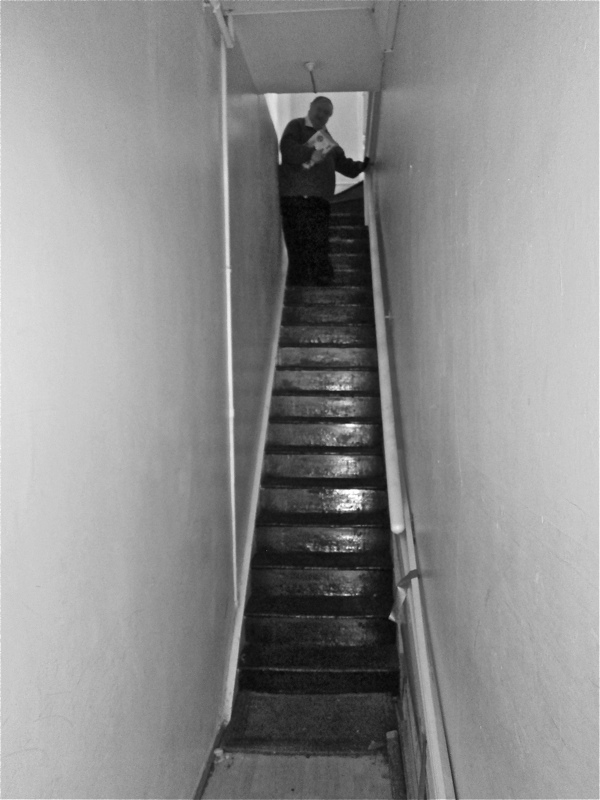 The landlord wanted to get me out because he could get seven times the rent, but when when the inspectors came round to assess the rent, I said, ‘Do you want to see my bathroom, it’s above the wardrobe?’ That brought my rent down.” And Clive raised his eyes to the tin bath on top of the wardrobe, chuckling in triumph. Before he came to Spitalfields, Clive had already gained a reputation as a writer, with two novels and two volumes of oral history published. “When I first started writing, I’d write a short story and it’d be accepted, but then the pace slows down …” he confessed to me, casting his eyes over to the shelf dedicated to the volumes that comprise his life’s work and then gazing around at the piles of notebooks, files and packets of his books, mixed up with the contents of his library scattered higgedly-piggedly around the room. 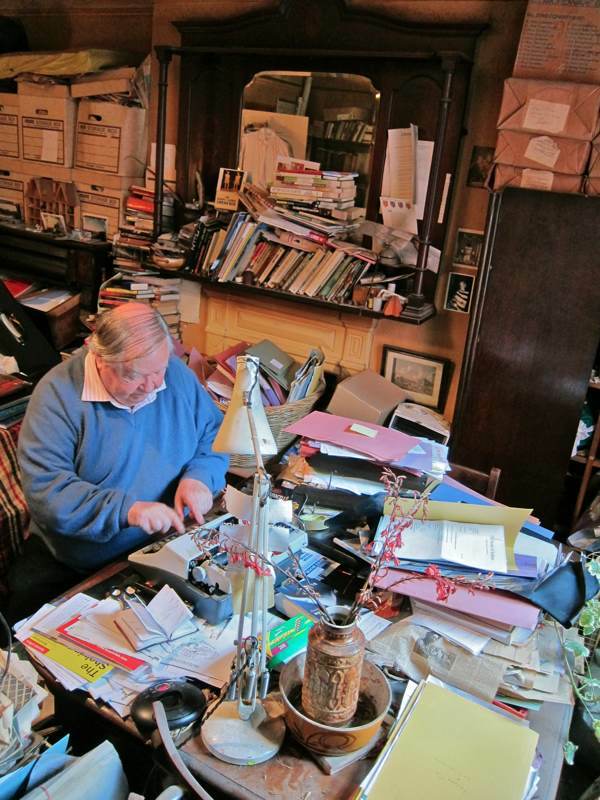 Note the wallpaper pattern books which Clive uses as scrap books for his press cuttings. Clive at his desk overlooking Brick Lane. 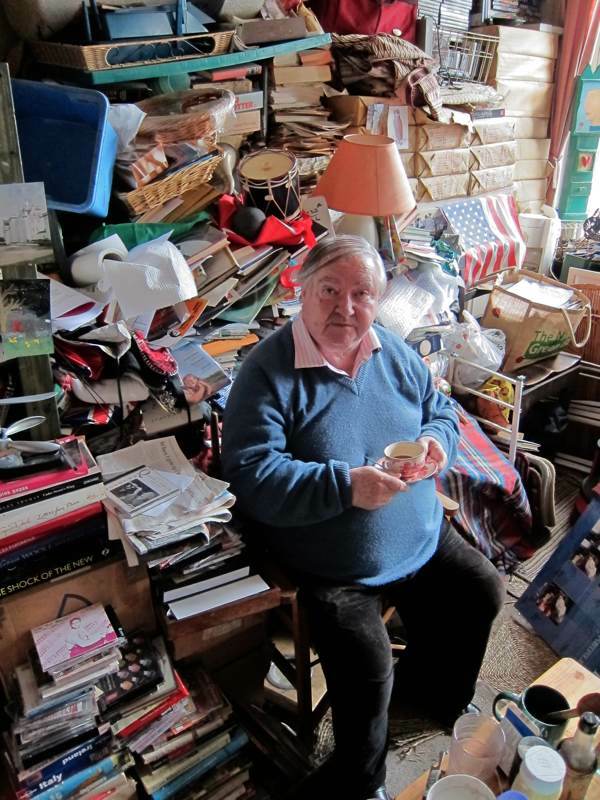 Clive: a treasure amid his trove! What wonderful portraits! And a wonderful bath! 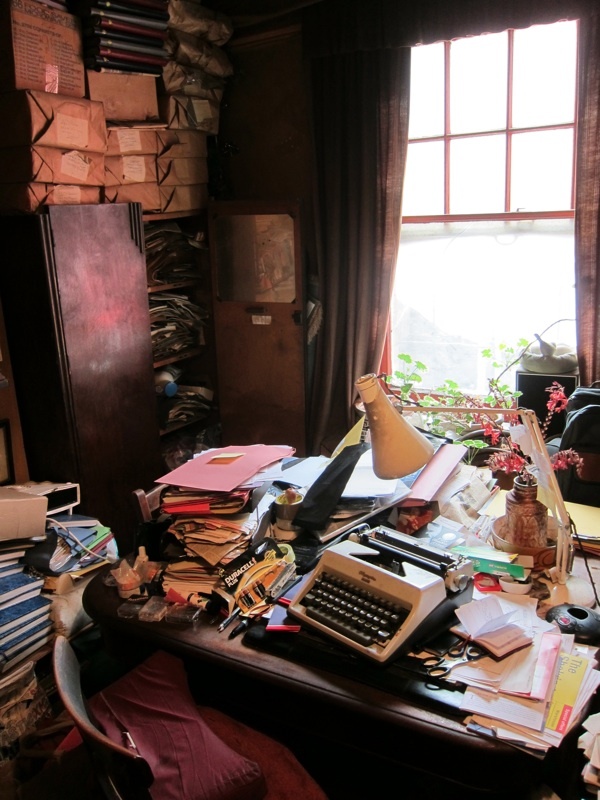 I have a friend who lives in a state of “organised chaos” like this. His company is a delight and he never ceases to surprise me. People like Clive are always interesting! is it possible to visit clive’s flat? Nice article. I look forward to reading Mr. Murphy’s works also. I love his organization (really)! His flat is a masterpiece, everything placed exactly as he wants it and can use most efficiently. I hope he has many happy years there. Thanks! Would have liked to see the clean up. HELLO CLIVE, IM JUST THE SAME AS YOU NOSTALGIA ALL OVER THE PLACE CAN HARDLY MOVE BUT IT MAKES ME SO COMFORTABLE, ENJOY. Clive’s flat is a thing of beauty. I hope he didn’t tidy it too much. 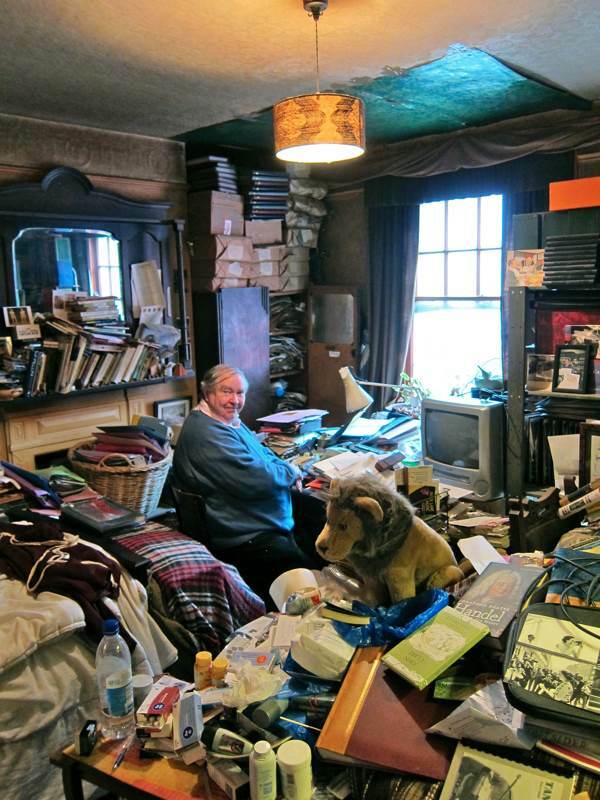 I could imagine his rooms being recreated as an art installation and winning the Turner Prize! 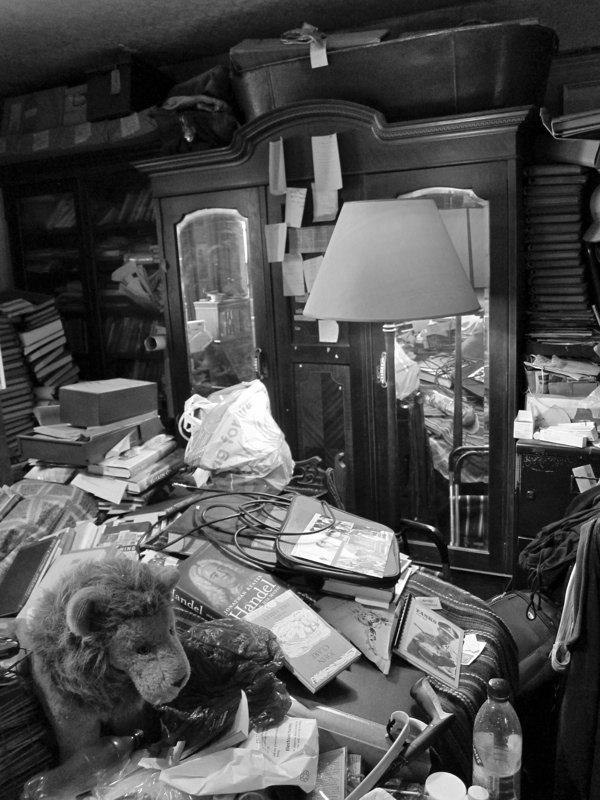 Do we know what will eventually happen to Clive’s super large collections. Where will it all go? Clive’s flat shortly after he moved in, what a delightful man.